Though Hercules had an enemy, Hera, on Mount Olympus, he also had a friend. 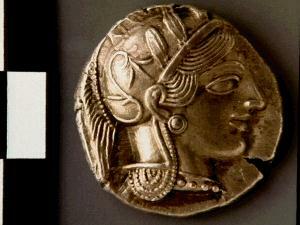 Dewing 1595, silver Athenian tetradrachm (=4 drachmas), ca. 449 - 420 B.C. The goddess Athena, wearing a helmet. Athena, the goddess of wisdom and military victory, and also the patron of the city of Athens, was Hercules' half-sister. Her parents were Zeus and Metis, a nymph. Zeus heard a prophecy that the child Metis bore after she gave birth to Athena would become the lord of heaven, so, to prevent this from happening, he swallowed Metis while she was still pregnant with Athena. 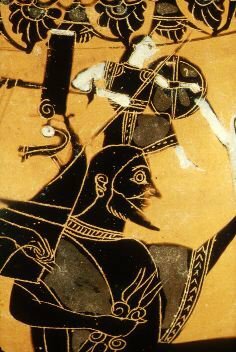 When the time came for Athena to be born, the smith god, Hephaistos, opened Zeus' head with an axe, and Athena stepped out, in full armor. 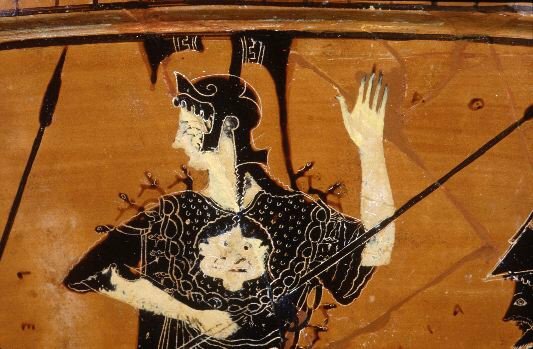 The birth of Athena was a favorite topic of Greek vase painters. Boston 00.330, Attic black figure panel amphora, c. 540 B.C. The birth of Athena. The goddess leaps, wearing armor, from the head of her father, Zeus. Athena often helped heroes, like Jason and Perseus. She wore an aegis, a goatskin shield which had a fringe of snakes. When Perseus killed the gorgon Medusa, whose face turned men to stone, he gave the gorgon head to Athena, and the goddess placed it on her aegis. Toledo 1963.26, Attic black figure calyx krater, c. 520-515 B.C. When Hercules went mad and killed his children, Athena stopped the disaster from getting worse. Just as the insane hero turned to kill Amphitryon, Athena threw a stone at Hercules, knocking him unconscious, so his mortal father was spared. Athena also helped Hercules at many points during his Labors. She provided him with the krotala he used to scare the Stymphalian Birds, and she carried the apples back to the garden of the Hesperides. This exhibit is a subset of materials from the Perseus Project digital library and is copyrighted. Please send us your comments.